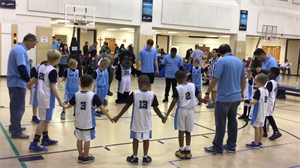 In our 9th season, Jarvis Memorial & St. James Upward Basketball League serves 386 boys and girls. NEW this year was complete uniforms including previously optional short & mock neck cheer shirts were included for every child. Coaches discussed the virtues of HONOR, ENDURANCE and FAITH during the regular season practice devotions this year with the children.